Modified from DCL110 basic model, the DCL110AD-3X is combination of DCL110 and 3X magnifier with flip up and down mount. 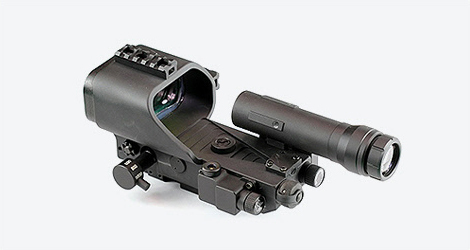 The addition of 3X magnifier enhances the sight’s capabilities. 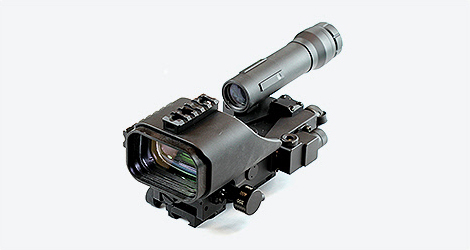 Used in the spotting position and target identification, the 3X magnifier provides viewing through the large FOV lens with the red dot to optimize the long-distance aiming accuracy. This model also supports an automatic reticle-brightness feature and night vision mode shift. DCL110AD-3x also have capability of transitioning from 12.7 mm to 7.62 mm ballistic drop compensation. Built-in 3X Magnifier with flip up/down capability. Adapted a wide lens (85x55mm) makes easier to track moving targets. Supports both 12.7 mm & 7.62 mm caliber firearms using dual trajectory compensation switching plate.